CCSS.ELA-Literacy.L.4.1a Use relative pronouns (who, whose, whom, which, that) and relative adverbs (where, when, why). 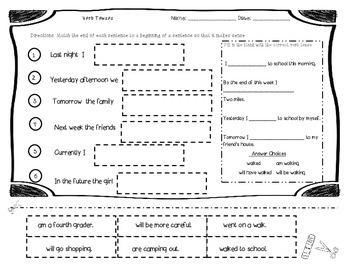 CCSS.ELA-Literacy.L.4.1b Form and use the progressive (e.g., I was walking; I am walking; I will be walking) verb tenses. CCSS.ELA-Literacy.L.4.1d Order adjectives within sentences according to conventional patterns (e.g., a small red bag rather than a red small bag). 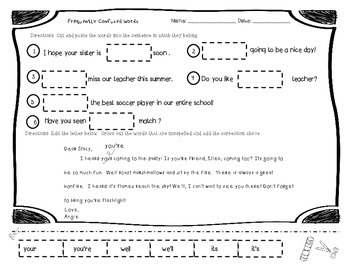 CCSS.ELA-Literacy.L.4.1e Form and use prepositional phrases. 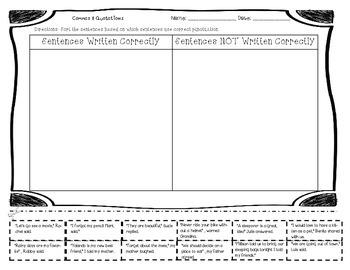 CCSS.ELA-Literacy.L.4.2b Use commas and quotation marks to mark direct speech and quotations from a text. 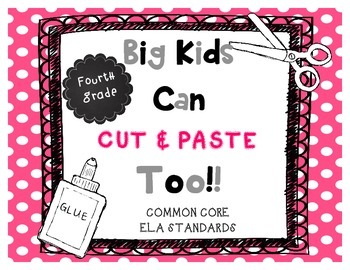 Click here for my Cut&Paste 4th Grade BUNDLE! I have used these in many different ways. My favorite way to use these is in a small group setting for remediation. These activities are geared towards who need extra practice and are not grasping the concepts right away. I teach an inclusion classroom and many of my students with disabilities shy away from writing and find ways to avoid it for hours (literally...) but if I give them scissors and glue they get to work much more quickly! I also like to use these as review at the end of the year or for sub folders. While the work is meant for students performing below grade level, they also have worked well for my substitutes because they keep the kids busy and engaged. Also, 5th grade teachers could benefit from these as many of the 4th grade standards are crucial for students to be successful writers in 5th! Please let me know if you have any questions before purchasing! :) Enjoy and thank you for your feedback!